When I review this OVA a while back, I thought that was all because the end of episode 2 was somewhat a conclusion. Since then, two more episodes had come out and apparently there are going to be seven total. With the help from episode 3 and 4, also episode EX from DVD, and episode 0, I kind of start to understand what they're trying to portray. 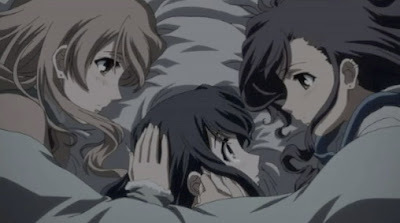 One thing I don't quite understand Japanese culture about is why they're trying to portray it in such a way that it is easily mistaken to be lesbian love instead of just normal love between sisters. Without episode 3 and 4, I could swear that's where they were heading. Do they just not distinguish them in Japanese culture? Anyway, even with the new development, it is still a ultra shoujo anime. So people don't like (or don't have the patience for) slow, soft plot development still shouldn't bother with it. Ef ~ A Tale of Melodies: HOLY CRAP!!!!! Mouryou no Hako: Stories within Stories? Shikabane Hime Aka: "B" Anime?